I love it when I find a wonderful vase that makes flower arranging easy. When we were filming at Dorothy McDaniel’s Flower Market, my eyes were drawn to this little vase that looks like bulbs sitting on the table. Upon further inspection, I realized this little vase is designed to hold three single blossoms, and my daffodils now stand nicely in the vase (pictured above). Another one of my favorite finds is a glass jar with a wire grid top (at left) that a very creative person made. I found it in Nashville during one of our antique stops. The wire grid at the top holds the flowers perfectly in place, taking the guesswork out of arranging. I have had the red-bottle vases (below) for years and just love putting flowers in these. The beauty of small bottles is that it only takes a few blossoms to create a very nice arrangement. This is fun for my grandchildren to fill with their picks from the garden. 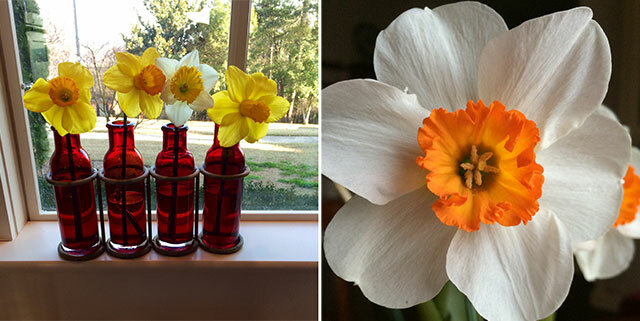 One small, simple bottle with one simple flower brightens a room. Be on the lookout for unique little containers that will make a great vase. When you find interesting bottles, put them aside for a special friend that might need a surprise. Flowers deliver a message without even having to say a word. Flowers are the language of love. What unorthodox items do you like to use as vases? I’d love to hear! Get this special issue today! I love the vase that looks just like a daffodil bulb! Where can you buy it??? I have one like Mary Myers’! It is brass, so could take on a verdigris patina, and holds just one flower stem. The base has “roots” below the bulb that form what the vase stands on. The glass jar with the wire flower frog can start a whole new trend for mason jars. Since the tops are already two parts, it would be easy to replace the one with wire. The handles would be a bit of a challenge, but could be worked out. I might just try one! Thank you for the reminder to go out and cut some fresh blooms! A job that I have taken on and love most among my many volunteer “jobs” is decorating the alter for our church. Our church was built in 1908 and has the most beautiful stained glass windows, rivaling churches that I have seen in Europe. I am always on the look out for new vases and other adornments that I can work into my displays. I want people to be looking for the “unexpected”. As I was out shopping the other day, I stopped at a shop where I have had my eye on a gorgeous vase. It was on sale! It just had to come home with me. Even though it is new, it gives the suggestion that it may have been in my basement for years. It is large, standing about a foot tall and square, but has a three dimensioned bird sitting on a branch on the front. And it is bright turquoise with a crackle finish. I just can’t wait to add a display of my favorite peonies in ruby and white and share them on the alter. I consider this “job” as part of my worship. I love your unique ideas that you share on this site—not just the vases but other items as well. I love to use small pitchers for small bunches of flowers to place in the center of my dining table. 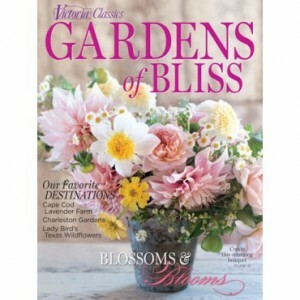 You can easily see over them, and they provide a colorful, fresh flower arrangement. I saw this adorable vase on the Dorothy McDaniel site when I purchased the tulip vase. It looks like I missed out on this one until fall. I love arranging flowers and believe that one or two small flowers from the garden make such a difference in the home. I found a perfect bud vase at heathceramics.com. I saw it in a trendy restaurant on all of the tables and had to have one of my own. Also, the website chive.com has wonderful quirky vases. Look at the pooley 2 vase. I love to share resources and hope that you enjoy. 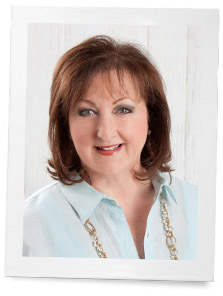 Phyllis, I love your blog! Thank you so much. I love the bulb bud vase! What a wonderful find. I have a sterling silver 3 stem rose bud vase that was given to me by my mother. I’m like you anything different/unique to arrange flowers in somehow finds it’s way to our house! As always, thanks for sharing. Great idea, bottle vase, for a quiet friendly way to give to someone, thanks for sharing. I love fresh cut flowers, n love vases. Love the bulb vase!!! As of 11:50 Central Time the vases are all gone until Fall. They are ordering more and will put you on their email for notification. So unique!! I have many vases but sometimes I have used mason jars or painted metal milk cans…but my latest find are tiny clear plastic napkin holders that double as tiny vases for a single bud flower for each setting…can’t wait to use them for Easter. How clever for both vases but the 1st is really ingenious! That is a lovely vase! 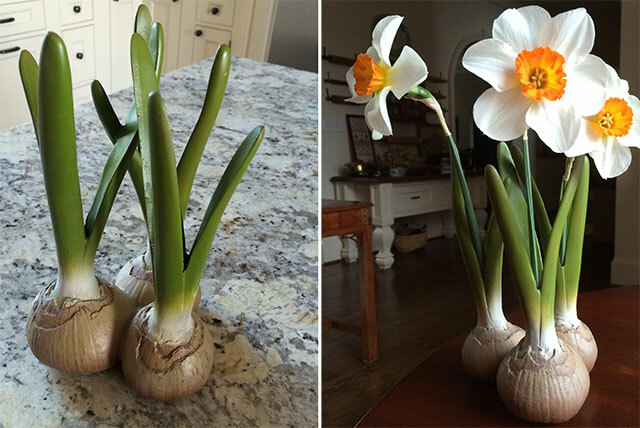 I also would love to have one of the bulb vases. Is there a source for them. Thanks~ I have a brass vase that is a bulb with leaves and a place to place one or two blossoms. And I have one that lays down horizontally……….looks like a flower on its side, is verdigris finish and holds just one blossom. Quite nice. Over the years I have put flowers in just about everything. Phyllis, I love the bulb vases. Are they one-of-a-kind? Any chance there are more to purchase somewhere? Diane, call Dorothy McDaniel’s Flower market. She said this morning that she had a few left and they would not be back until fall. 205-870-0092. WRONG NUMBER….the correct number is 205-871-0092. Sorry I typed incorrectly previously. 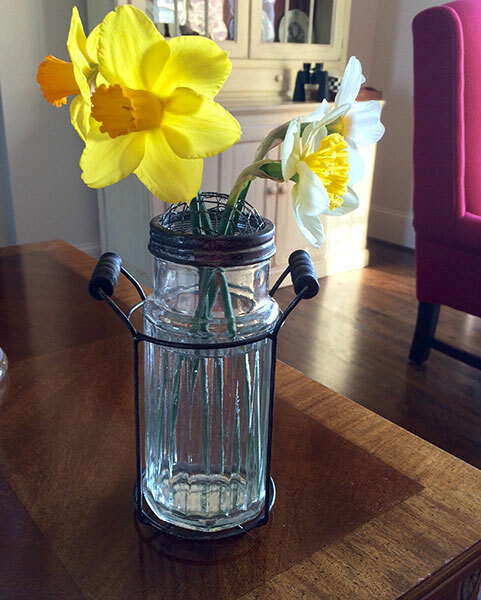 I love this vase.i have a similar one imaged metal with a lovely blue green patina and holds one bud.Happy Spring!